A landmark ruling at the Embu High Court on Thursday declared that fees charged during the filling of P3 forms at police stations were illegal. Justice Florence Muchemi during her ruling stated that the Kenyan constitution did not provide for the issuing of a fee during filling of P3 forms. “No policy or statutes purports that victims of violence seeking medical treatment pay for the filling of P3 forms,” Muchemi asserted. The historic ruling was made in a case involving the Legal Resources Foundation Trust who had sued the Health Ministry, questioning whether the P3 form charges were legal or not. The legal resource foundation Trust affirmed that they had indeed filed the lawsuit which they won. 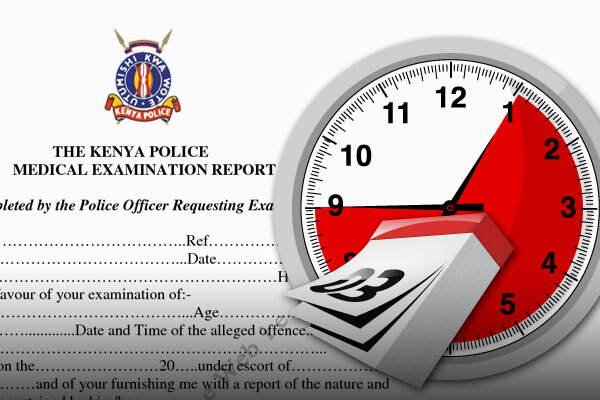 A P3 form is a Kenya Police Medical Report Form, used by the Police. Simply put, the P3 form acts as evidence that a violent act occurred and is therefore referred to as an “Exhibit” in court. The P3 form is issued at police stations or downloaded from the National Police Service website, but still filled at the police station where the incident in question was reported. Legal Resources Foundation Trust lawyer- David Njoroge had cited the Attorney-General and the Inspector-General of Police as the second and third respondents respectively in the civil suit. Mr. Njoroge had argued that victims of violence, especially in sexual assault cases could not afford to pay fees charged, usually, leading to their cases being thrown out due to lack of evidence. Justice Muchemi during her landmark ruling went on to reveal that a survey conducted in Embu, Kiambu, Nakuru, and Mombasa indicated that cases of victims of domestic violence were thrown out due to P3 forms ( which form part of the evidence) not been filled. The post Historic ruling declares p3 form charges illegal appeared first on Kenya Today.